It stays out of sight and you rarely give it a thought. But sewer line repairs are expensive. If you have a sewer line clog, you suddenly have a lot to worry about. Finding a qualified contractor, getting the right permits and overseeing a messy project is a hassle. Tree roots are the number one reason for sewer line damage, but there are other ways your sewer line can become clogged or broken. Foreign objects that won't dissolve can become lodged in the line. Age, general deterioration and extreme changes in temperature over a period of time can also cause a sewer line to buckle or break. And in some instances a sewer line can be misaligned due to ground shifting or improper installation. 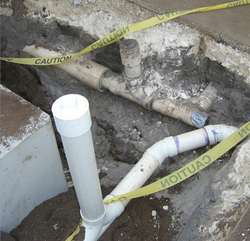 Leo Gotelli Plumbing can provide a video sewer inspection to see if sewer line repairs are necessary. The camera finds out exactly what and where the problem is without the expense of "exploratory" plumbing. Video inspection can also confirm the structural condition of your lateral pipes. It can tell you if an auger or high-pressure flush can solve the problem, or if more extensive repairs are necessary. Contact us today for a video inspection of your sewer plumbing at 415-467-6600.